Managing a large data set using JCR in a production environment sometimes requires special operations with indexes stored in a file System. One such maintenance operation, called “re-indexing” consists of recreating an index by re-scanning the data. You usually need to re-index when you observe odd behaviours or many errors in the logs. There can be various reasons to re-index. For example, hardware faults, hard restarts, data corruption, migrations, or simply after an upgrade to enable new features. A re-index is usually requested on server startup or in runtime. Elasticsearch re-indexing How to perform Elasticsearch re-indexing. JCR Asynchronous re-indexing How to perform JCR re-indexing. With eXo Platform, you can re-index using the interface. To do this follow these steps: 1. Connect as an administrator. 2. 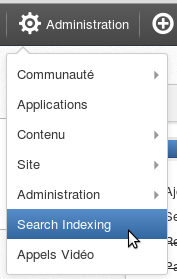 In the top bar, select Administration –> Search indexing. 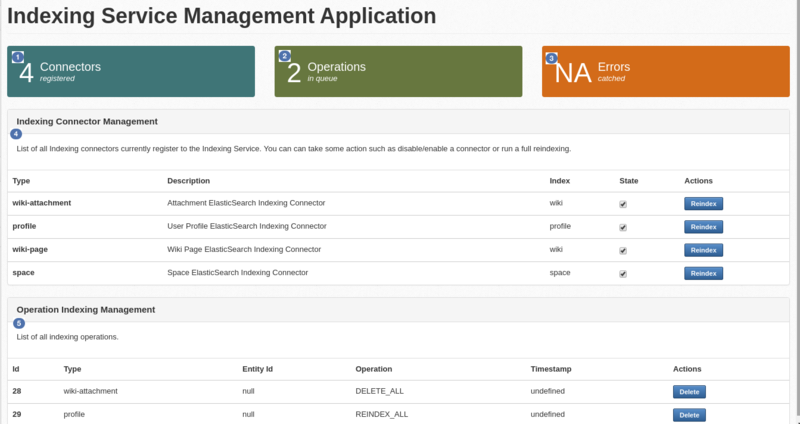 The interface of the Indexing Service Management Application will appear. This allows to re-index by profile. (You can read more about this interface below). Select the connector you want to re-index and click on the corresponding Reindex button. : Number of registered Elasticsearch indexing connectors. REINDEX_ALL: to re-index all the indexes. DELETE_ALL: to delete all indexes. CREATE: to create the indexes. : Number of errors found . : List of registered Elasticsearch indexing connectors: wiki-attachement, profile, wiki-page and space with the possible actions on them. : List of the indexing operations in progress. The easiest way to trigger a JCR re-indexing at start-up is to stop the server and manually remove the indexes that need to be recreated. When the server starts, the missing indexes will be detected and the necessary re-indexing operations will begin. JCR supports direct RDBMS re-indexing. This is usually faster than ordinary re-indexing and can be configured via the rdbms-reindexing QueryHandler parameter set to “true” (Refer to the Query-handler configuration overview for more information). [INFO] Setting index OFFLINE (repository/production[system]). [INFO] Created initial index for 143018 nodes (repository/production[system]). [INFO] Setting index ONLINE (repository/production[system]). These two log lines indicate the end of process for the workspace given in brackets. Calling isOnline() as mentioned above will also return true. getIOMode: return the current index IO mode (READ_ONLY / READ_WRITE), belongs to clustered configuration states. getState: return the current state (ONLINE / OFFLINE). Some hard system faults, errors during upgrades, migration issues and some other factors may corrupt the index. End customers would most likely want the production systems to fix index issues during runtime without delays and restarts. The current version of JCR supports the “Hot Asynchronous Workspace Reindexing” feature. It allows administrators to launch the process in background without stopping or blocking the whole application by using any JMX-compatible console. 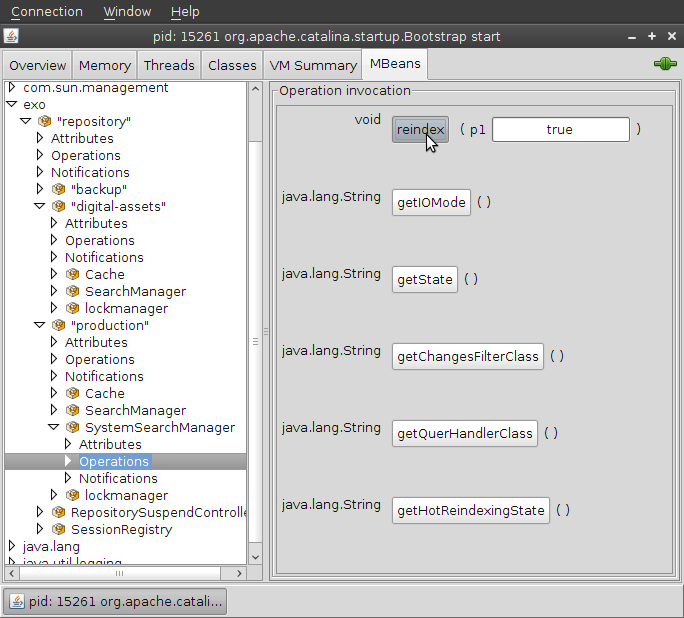 (See the “JConsole in action” screenshot below). getHotReindexingState(): return information about latest invocation: start time, if in progress or finish time if done.